Play and earn something extra in every spin you make! Introducing the new Charms Feature. Note: This feature is on a slow roll out. So if you don't see this feature in your game, fear not. It'll be on your way soon! To know more about this feature, check out the following "FAQs" to help you as you make more spins. They’re new gift items that can be activated to enhance your game play for 1 hour period. These items are new gift type that you can see in your Gift Chest. These are also giftable. > How do I get charms? Charms can be earned by betting enough over a span of time. 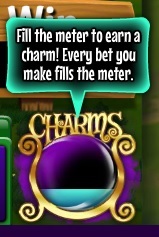 Each time you bet, your bet amount you will earn equivalent points to fill the Charm Meter. The higher your bet, the faster it fills the Charm Meter. Whenever you earn a Charm, you will have the option to save it and share with your Friends, so you may also get some when your Friends earns one and sends it to you as Gifts. > What Charms can I collect and what do they do when I activate them? These charms vary from common to the rare ones. SUPER BONUS - Collect daily bonus every 30 minutes for one hour. DOUBLE VIP - Earn Double VIP points for one hour. DOUBLE GIFTS - Double your daily gifts limit for one hour. DOUBLE XP - Earn double XP Points for one hour. 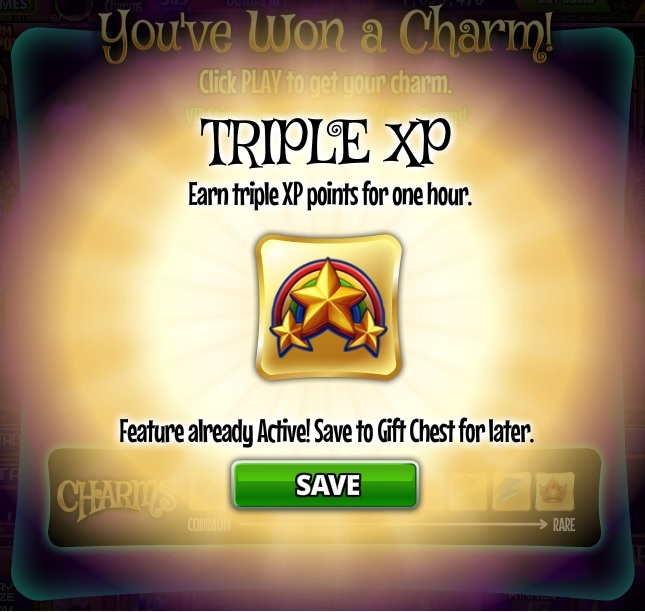 TRIPLE XP - Earn Triple XP Points for one hour. SUPER UNLOCK - Unlock all games for one hour. HOT STREAK - Mystery Gifts are twice as frequent for one hour. 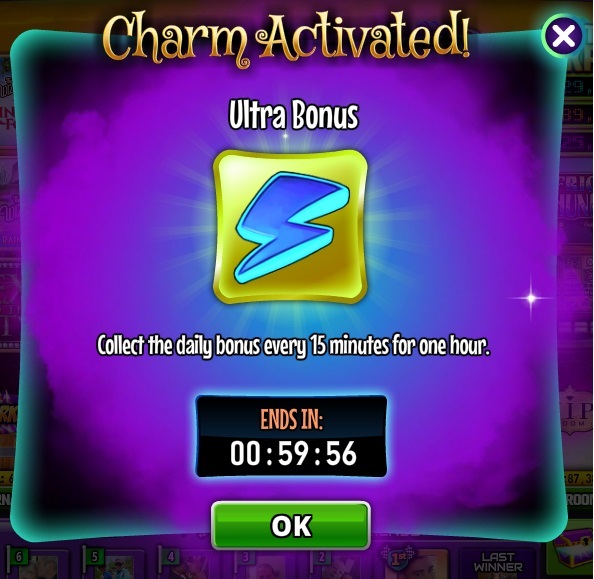 ULTRA BONUS - Collect Daily Bonus every 15 miuntes for one hour. TRIPLE GIFTS - Triple your Daily Gifts limit for one hour. > How do I know if I won/received a Charm? You can check your Gift Chest for Charms that are sent to you by your friends. You can also click the Charm Meter to access your Gift Chest. When you earn a Charm during regular game play, you will get a similar notification shown below. Click "Play" to activate the Charm Selector to see what Charm you won. Once you get your Charm, it will notify you to either "Use" or "Save" the Charm. 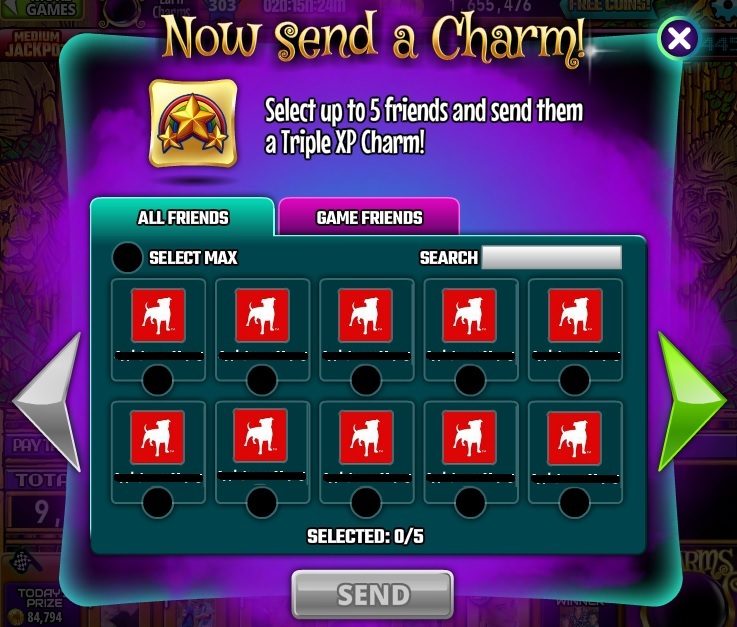 In this case, the game is already in triple XP feature so you will only get an option to Save the Charm. 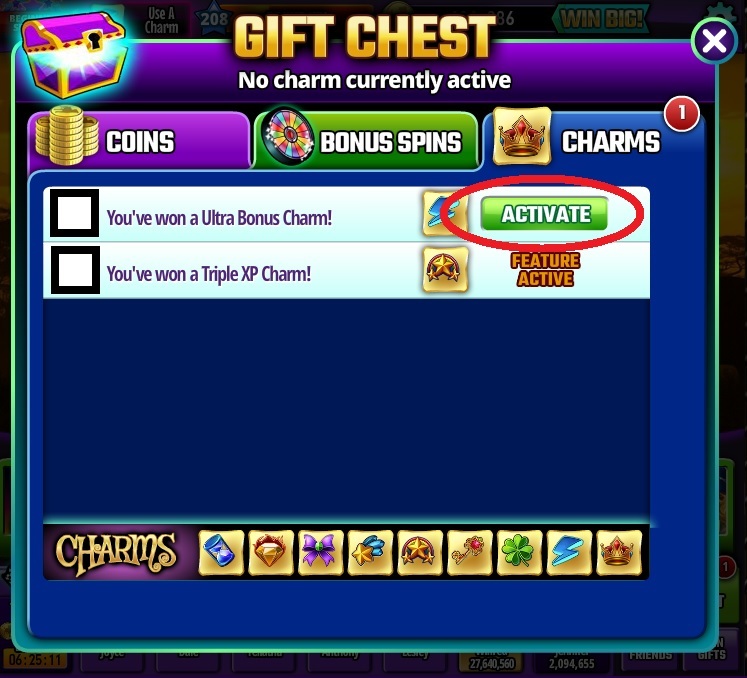 Saved Charms will automatically be listed in the Charms Tab in your Gift Chest. After you "Use" or "Save" the Charm, you will then get the option to share it up to 5 of your Friends. You need to manually select to whom you wish to send these Charms. For your convenience, you can also use the Search Tab. Note: the Send Button can only be used once you selected your friends. > How do I activate a Charm? To activate a charm, you have two ways to do it. You can also access your Gift Chest by clicking the Charm Meter. 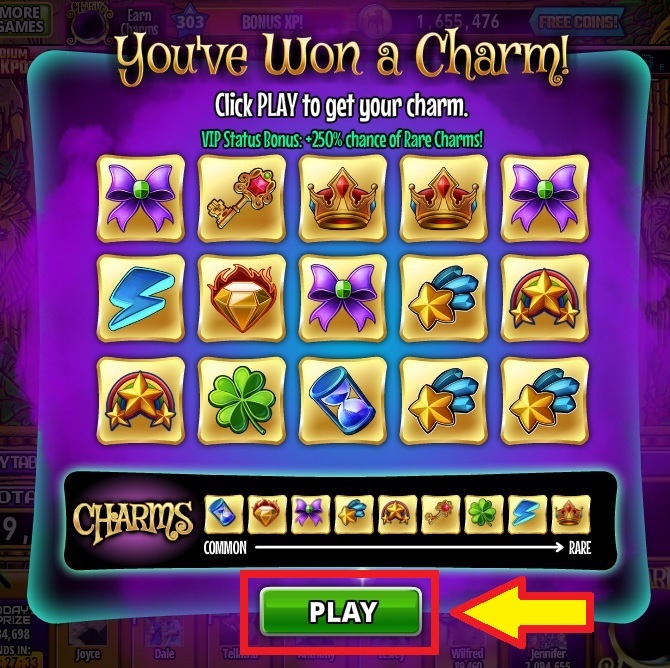 Once you are there, you will need to click the Activate Button of the Charm of your choice. Once you hit "Activate", a prompt will pop-up to show the Charm you activated and its benefit with the Timer when it will end. Hit on "OK" to get back to the Main Lobby and start playing. When you are back in the main lobby, you will see the Active Charm on the Top Counter. You can also hover your cursor to the Icon to see how minutes you have left to enjoy this charm. > Can I activate two or more charms at the same time? No, you can only have one charm active at a time. Also, Charms do not stack with similar events (i.e., a DoubleXP charm used during a DoubleXP event does not give 4x XP). You can use them as soon as the event is done to enjoy its benefit. Gifted Charms have an expiration (3 days) while Charms you earned does not. Also, you can use up to 5 gifted Charms per day while earned ones, you can use as many as you want. It's time to enjoy this feature and let's all keep spinning!